I have to say, I do indulge into the white crystals when the uncontrollable temptation wins. But sweetie, savory morsels will always win with me. Since dessert is usually served last, sometimes it feels like it should also be made in that order. The beauty with this dish is that you can grill it first - especially if you have a bunch of saucy concoctions on the menu - and pop everything in the fridge for a cool treat later on in the party. So pucker up sugar, cause you're "kiss the cook" apron is working full time today. Coat the halved and pitted peaches in vegetable oil. 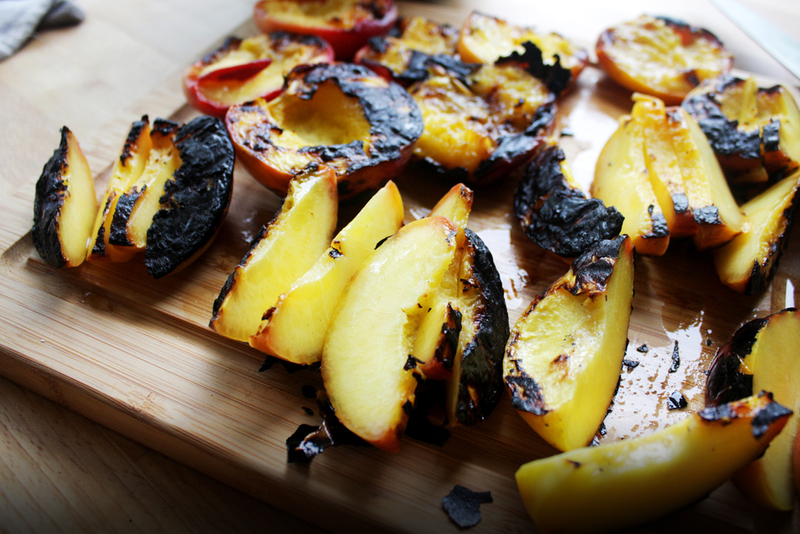 Grill the peaches, cut side down, on the hot zone of the grill for about 3-5 minutes. Carefully turn the peaches over and grill for about 3-5 more minutes. Cool the peaches to room temperature. In a large bowl, use a wire whisk to whip the whipping cream. Use large circular motions to beat the cream until you it firms up to the desired consistency. Add in the vanilla, powdered sugar, and cinnamon and whisk until evenly incorporated. Keep in the refrigerator until ready for serving. Slice the peach halves, dollop the whipped cream and sprinkle with brown sugar to serve.